The OmniSwitch 9000E provides advanced security and quality of service (QoS) features at an attractive price and is fully supported by the OmniVista™ 2500 Network Management System. The OmniSwitch 9700E Chassis LAN Switch (CLS) is the most popular chassis in the OmniSwitch 9000E family. It is a ten-slot chassis (11 RU) with two slots for chassis management modules (CMMs) and eight slots for network interface (NI) modules, supporting an aggregation of up to 192 GigE ports or 16 10GigE ports. Designed for continuous operation, the OmniSwitch 9700E CLS features “no single point of failure,” supporting dual CMMs and redundant fans and power supplies. Sparing for the OmniSwitch 9000E family is simplifi ed because the OmniSwitch 9700E shares a common set of NI modules, power supplies and fan trays with the rest of the OmniSwitch 9000E family. The OmniSwitch 9702E Chassis LAN Switch is a NEBS-ready variant of the OmniSwitch 9700E. The OmniSwitch 9702E also introduces a new backplane to accommodate higher performance for future modules. The OmniSwitch 9800E Chassis LAN Switch (CLS) is the largest chassis in the OmniSwitch 9000E family. It is an 18-slot chassis (17 RU) with two slots for CMMs and 16 slots for NI modules, supporting an aggregation of up to 384 GigE ports or 32 10GigE ports. Designed for continuous operation, the OmniSwitch 9800E CLS features “no single point of failure,” supporting dual CMMs and redundant fans and power supplies. 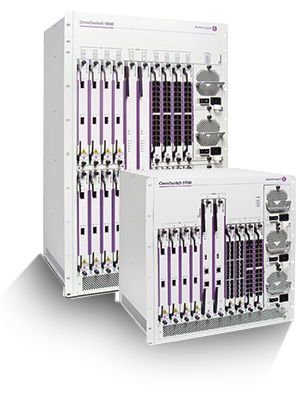 Sparing for the OmniSwitch 9000E family is simplified because the OmniSwitch 9800E shares a common set of NI modules, power supplies and fan trays with the rest of the OmniSwitch 9000E family.